One man’s litter… – snackettes. Indonesia is known for its coffee, and within Indonesia, the island of Bali has a style of its own: incredibly strong (both in flavor and caffeine content) and usually served unfiltered, with grounds directly in the cup. Zooming even further, Munduk, Bali is home to a blend of coffee that has been called the rarest (and also best tasting) on Earth! Steph and I happened to be in Munduk for 4 nights, and with my love of coffee, we had to check this out. It may be worth pointing out here that we also tend to get a kick out of trying unusual, and sometimes even bizarre foods. Coincidentally, the process in which this particular kind of Munduk coffee is produced is not at all usual, or even for the feint of heart. At the center of this coffee’s production process is the civet, a furry little forest cat that lives in the trees in the jungles of Indonesia. The civet dines mainly on coffee berries, and Munduk’s climate produces some of the highest quality coffee berries you can find in Bali. The civet also happens to be incredibly picky about the ripeness, consistency, and quality of the berries it eats. So picky, we’re told, that farmers long ago noticed its discerning taste (don’t ask me how), and realized this kitty was far more skilled than them at finding only the absolute highest quality coffee berries in their trees! …if you’re still following along, you probably know where this is going. Skip ahead a few hundred years (I’ve no idea how long actually), Civet cat coffee, or “Kopi Luwak”, is still produced by a small company in Munduk. The harvesting of the beans is even still done by hand – er, glove? – in the wild, and nowadays they’ve introduced strict sterilization procedures to cleanse the beans after harvest and before roasting. The coffee even passes the Indonesian equivalent of the FDA, so clearly somebody’s pockets got lined! Anyway, we went to the place and ordered a cup. It cost about as much as a large Starbucks latte ($4 US, about 8 times as much as any cup we’d bought here). The very nice woman working the at the shop brewed the beans espresso style in this crazy little kerosene-driven coffee robot below. 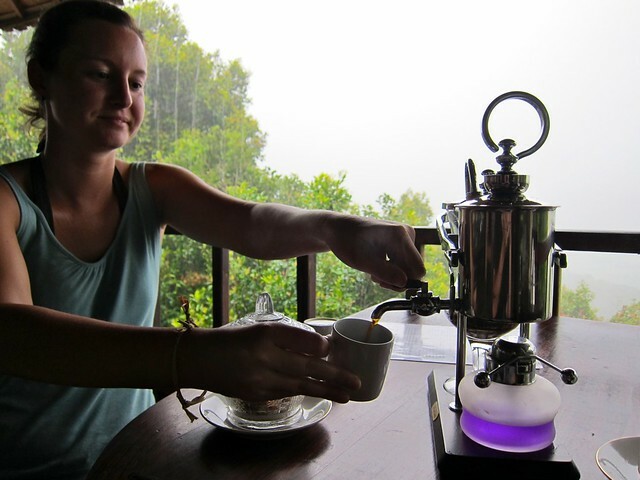 The water passed back and forth 3 times into the collection vessel via syphon as it heated and cooled – very entertaining! Turns out the people are right, the coffee was quite good. I wouldn’t say it was the best cup I’ve had or anything, but it was very tasty. A worthy excursion, for sure! Now I’d drink some of that UF stuff. I read this to Riley and he says he is very embarrassed you have blogged to the world that he doesn’t properly cover his ‘turds’. I believe the correct translation of his meows is “EAT MY SH__” so he has offered to save his doo doo for you to brew! That said, we were told this “seeping” is actually one of the things that sets this process apart from lesser coffee harvest processes – the other fruits and acids in the civet’s gut apparently add a desired complexity to the beans! Hilarious, mom 🙂 Give Riles & Mase a hug for us!